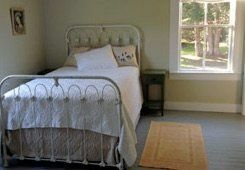 The Mendocino Coast Victorian has three comfortable, graciously decorated bedrooms, each with its own ensuite. The South bedroom has a double sized bed. 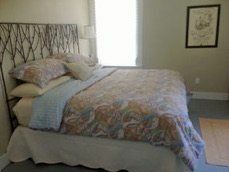 While the North bedroom has a king sized bed which can be converted to two singles, if needed. The master bedroom has a queen sized bed and television. 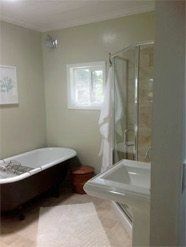 The master bath features two sinks, a claw foot bath tub and a separate shower. 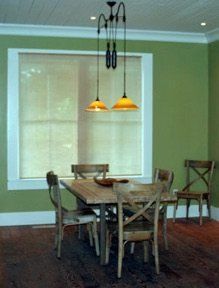 A thoroughly modern kitchen and spacious dining room make entertaining and family meals a memorable experience. 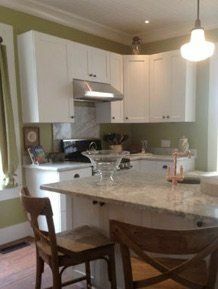 The kitchen island has bar style seating for quick meals or easy conversations with the chef of the house. A handy butler?s pantry keeps the dishes out of sight. Amenities include satellite television and broadband internet with wireless access; a DVD player with an extensive DVD library. 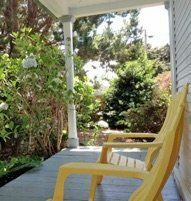 There is a gas fireplace with remote on/off switch and a covered porch with deck chairs for reading and relaxing outdoors. Minutes by foot or car to the gorgeous and vast Manchester State Beach which includes 5 miles of sandy beach and hiking trails through the sand dunes. An easy walk to the local country market which stocks everything from bourbon to baby bottles. The Victorian is located near the Manchester Grange, which makes it conveniently accessible for those once a month Sunday Grange Breakfasts or family reunions, wedding receptions and/or large gatherings. Stayed for 2 days in August, 2016 We had a great time staying at The Victorian. The whole experience staying at a home built in 1896 is a bit surreal. 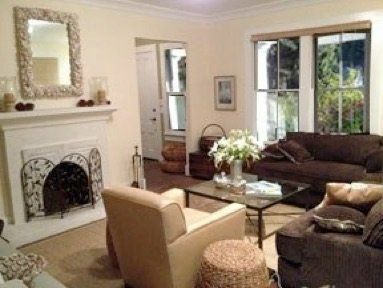 The owners have maintained the home interiors very tastefully. The Kitchen is totally a chefs kitchen. The event hall next to the property is the only drawback. There was a party the weekend we stayed and loud music till midnight was not desirable. Getting the keys to the house was an issue since the property management company didn't keep it at the location where they promised and we had to make couple of calls and they drove in to the property and handed over the keys. Overall a good Getaway. The country store is 3-4mins away and that made it very convenient. Thanks to the owners for letting us stay at The Victorian. Stayed for 3 days in September, 2016 We had a wonderful stay at the Victorian. It was stocked with everything we needed. 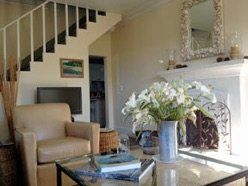 The location was perfect with easy access to the beach and a short drive to Point Arena and Fort Bragg. 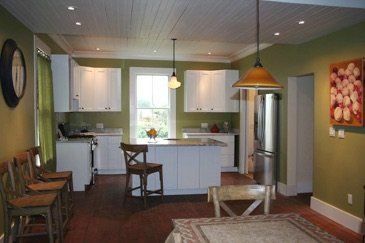 Stayed for 3 days in December, 2016 Beautiful home - felt so welcoming - had all the right stuff in kitchen, very clean, beautifully furnished, great beds, a wonderful spot to rest and restore! !Staff were fabulous and supportive?? Stayed for 3 days in September, 2017 The house we stayed in was great. The service/operation of Irish Beach was so awful I'm embarrassed for them. There were several early signs of this - before our visit, we had a few minor questions, but trying to get a hold of anyone by phone or email was impossible. Calls went unanswered, there was no messaging machine, and I don't think the people there know how to use email. The biggest glaring issue was that in the info they provided us, THE ADDRESS FOR THE HOUSE WAS WRONG!! We spent 1 hour driving in circles, in the middle of the night, looking for our house. There were 2 emergency numbers listed in the information packet, but no one answered when we called, nor returned our messages EVER to see if we were ok. After our stay, I tried calling probably 20 times to let them know that the address they have on file is wrong. When I finally got through to someone, they did not apologize, or even admit that there was a problem. They said they would look into it and call me back, which they never did. Needless to say, these people are either lazy, incompetent, careless, or most likely, all of the above. This review is coming from someone that has very low standards - I just hope to receive common decency and respect, especially when we paid so much money.